President Franklin Roosevelt, second from left seated at the table, signing the "Declaration of United Nations" on 1 January 1942 (United Nations). 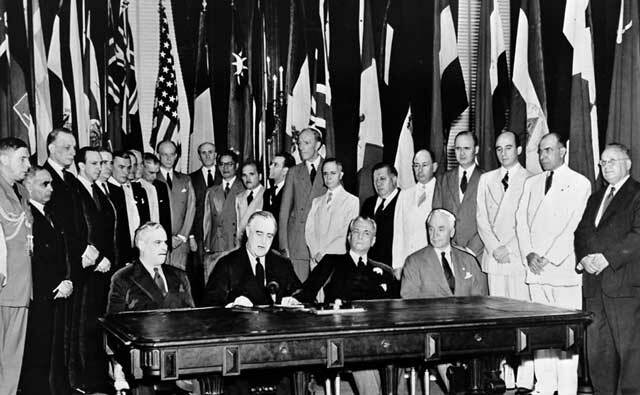 The "Declaration by United Nations" becomes the counterpart to the Tripartite Pact by the Axis powers, with more signatories signing after the main powers (Germany, Italy, and Japan in the Tripartite Pact) do. Another 22 nations sign on 2 January 1942. While the United Nations per se is not yet in existence, the organization considers 1 January 1942 the day on which its name is coined. President Roosevelt is credited with coming up with the name "United Nations." Cartoon by Munro in the Civil & Military Gazette, Lahore, 1 January 1942. Churchill is in the dining car of his train from Canada to Washington, D.C. when the new year begins. Battle of the Pacific: In the Philippines, the Allied forces continue withdrawing from Manila to Bataan on 1 January 1942. South Luzon Force completes its withdrawal behind the Pampanga River at Calumpit by dawn. The Philippine Scout engineers then blow the bridges, something the Japanese generals had hoped their own airplanes could have done before the Americans crossed them. It then disbands into its separate units, which all head to different defensive positions in the Bataan Peninsula. The Filipino 71st and 91st Divisions pull back toward San Fernando, while the Filipino 11th and 21st Divisions hold open the road from San Fernando to Dinaluphihan at the neck of the Bataan Peninsula. The US Provisional Tank Group takes heavy losses of its M3 Stuart tanks of the 194th Tank Battalion but holds off the Japanese. US Army Air Force units also continue their withdrawals, with headquarters of the 24th Pursuit Group abandoning Clark Field for Mainveles, Luzon, Philippines, and the remaining ground troops of the 14th Bombardment Squadron leaving Clark Field for Bugo, Mindanao. On the Malay Peninsula, the Japanese continue to exert extreme pressure on the Commonwealth troops defending the Kampar line in the west. Japanese planes raid Tengah airfield in Singapore, causing extensive damage. 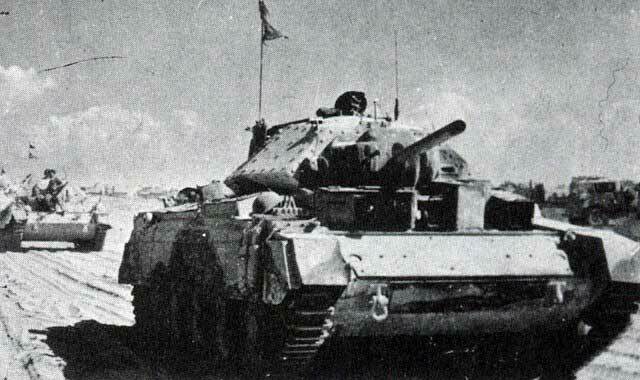 A British Crusader tank in North Africa, 1 January 1942. Eastern Front: The Soviet Stavka extends its general offensive against the Axis into the extreme northern end of the front. Six Red Army divisions (71st, 186th, 263th, 289th, 313th, and 367th) supported by a ski brigade and three Marine brigades (61st, 65th, 66th) attack between Lake Onega and the White Sea toward the town of Karhumaki (Medvezhjegorsk). Finnish II Corps defends in this area with two divisions. It gives ground near Krivi, but there are no major objectives nearby and the Finnish troops continue to display their excellence at both winter and forest fighting. "The crew clearing up decks at the end of the day as a destroyer steams away on patrol." 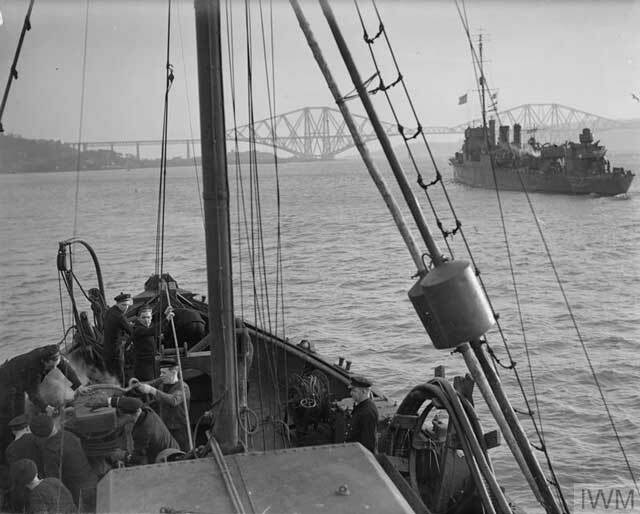 This photo was taken on board HNMS Alcmaria at Port Edgar, Rosyth, 1 January 1942. © IWM (A 6939). The Red Army consolidates its recapture of the Kerch Peninsula in the Crimea while General Erich von Manstein, commander of 11th Army, assembles forces for a counterattack. German 42nd Army Corps, which is composed of only one division, has established a tenuous defensive line about 20 km west of Feodosia. Manstein brings up Gruppe Hitzfeld (Colonel Otto Hitzfeld), composed of Infantry Regiment 213 of the 73rd Infantry Division reinforced with an artillery battalion, an anti-tank gun battalion (Panzerjäger-Abteilung 173), four StuG III assault guns and an anti-aircraft detachment. Soviet 44th Army uses its 23,000 soldiers to try to break through the German line, but a Soviet armored attack on German 42nd Corps headquarters at Islam-Terek fails. The Soviets lose 16 T-26 tanks and suspend their attempt to proceed further west to relieve Sevastopol. The Red Army has more troops further east in the Kerch Peninsula, but the 51st Army shows no sense of urgency in assisting the 44th Army. 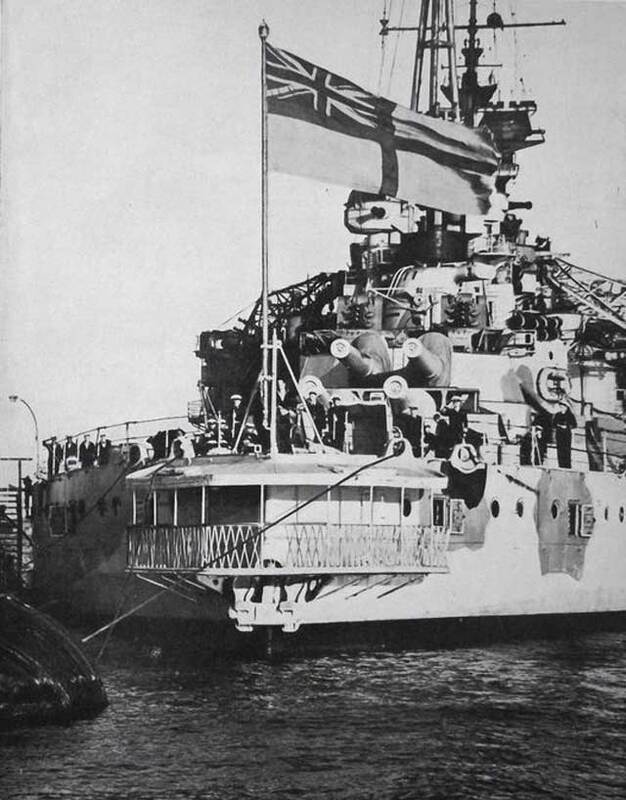 HMS Queen Elizabeth in Alexandria Harbor, 1 January 1942. Battle of the Mediterranean: A large German force of 7,000 men continues to hold out at Bardia. It is now far behind British lines and has no hope of relief, but morale remains high and they defend vigorously. The 2nd South African Division of British 30 Corps of Eighth Army attacks after sunset with overwhelming strength and quickly gains ground on the main road. The Germans and Italians continue to hold a very large area around Halfaya, but they cannot be supplied except by inadequate Luftwaffe air drops and are short of food and water. 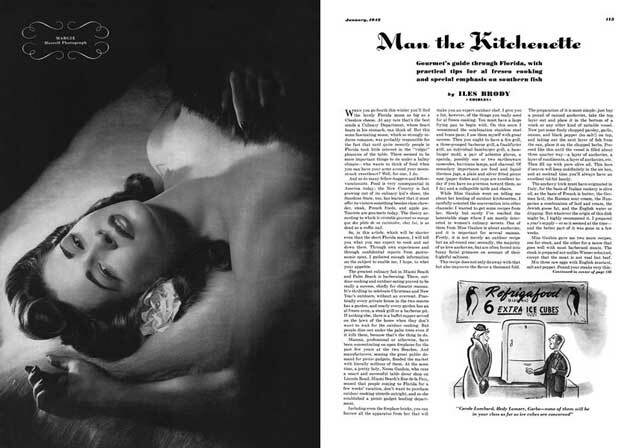 "Man the Kitchenette," an Esquire Magazine article from 1 January 1942. Among other things, it recommends the $2 cold buffet at the "Alibi Bar" in Palm Beach. US/Philippine Relations: The United States freezes all Philippine funds due to the war situation. The US Treasury order states that this is done "in view of the situation created by the temporary enemy occupation of important parts of the Philippine Islands." 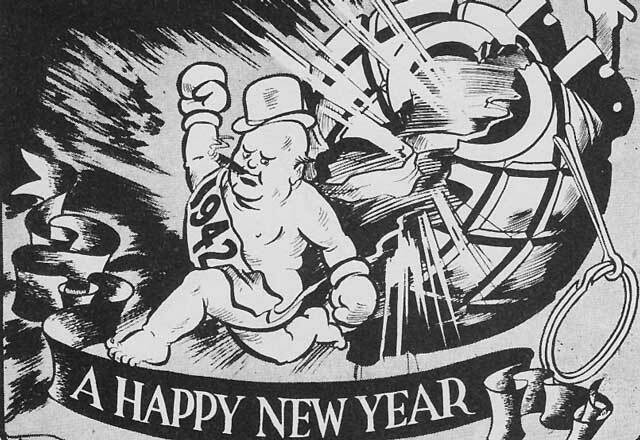 Here’s to 1942, here’s to a year of toil—a year of struggle and peril, and a long step forward towards victory. May we all come through safe and with honor. This quote is from Churchill by Himself page 498, the predictions chapter entitled “Churchill Clairvoyant.” The first published reference is in Churchill’s speech volume, The End of the Beginning (London: Cassell, 1943, page 3). 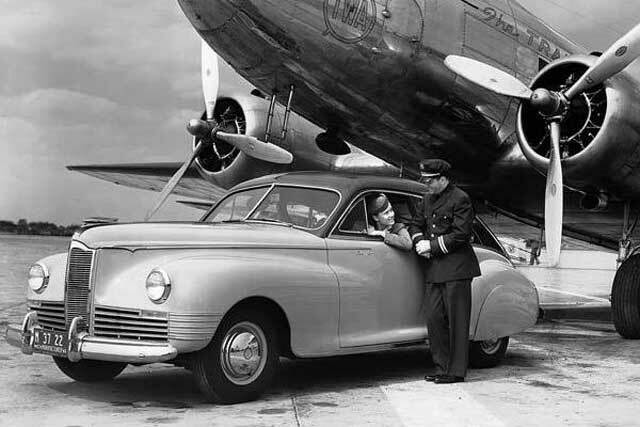 1942 Packard Clipper Club Sedan with DC-3. There were 34,046 Packard Clippers built in the 1942 model, so they are not much rarer than the 1940 and 1941 models. Some were built while chrome plating was still allowed. Pre-war Packards are considered top-grade collector's items because of their quality manufacture and distinctive styling. American Homefront: The U.S. Office of Production Management bans the sale of civilian cars and trucks. The major automakers including Ford, Studebaker, Packard, and General Motors begin converting their assembly lines to war production. 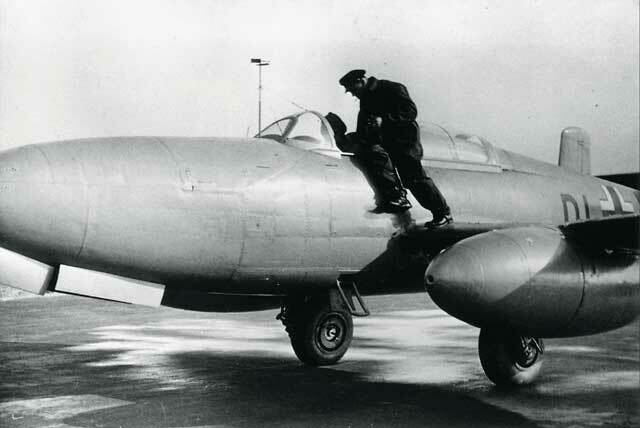 However, a small number of cars still come off the assembly lines in January and the first four days of February 1942. Those cars built during 1942 (and not 1942 models built in late 1941) are distinguished by a lack of chrome (which already had been banned) and have painted exterior trim. These cars naturally become collector's items due to their scarcity and become known as "blackout" or "victory" models. These blackout models are difficult to sell because sales of new vehicles are rationed (as are tires and gasoline and other necessary auto needs) and many spend months or years on car lots before being sold. 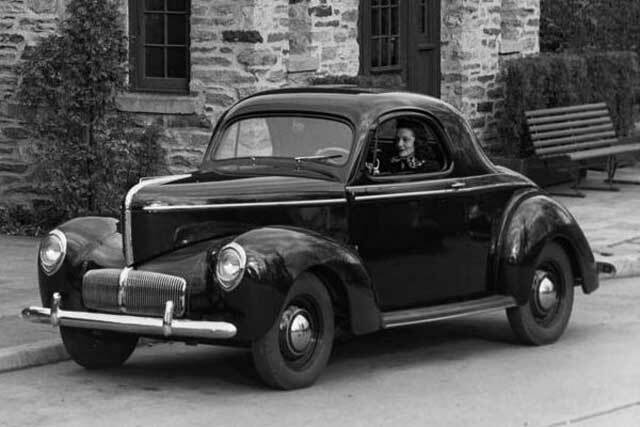 Final figures for 1941 automobile production are 3.6 million. The Rose Bowl is held in Durham, North Carolina, due to the war situation. The Oregon State Beavers beat the home-field Duke Blue Devils 20-16 anyway. In the Sugar Bowl, the Fordham Rams beat the Missouri Tigers, 2-0, the Alabama Crimson Tide beats the Texas A&M Aggies 29-21 in the Cotton Bowl, and the Georgia Bulldogs beat the TCU Horned Frogs in the Orange Bown, 40-26. "The Man Who Came to Dinner" premieres at the Strand Theater in New York City. It stars Bette Davis, Ann Sheridan, and Monty Woolley and is directed by William Keighley. Also appearing are Jimmy Durante and Billie Burke. Woolley, who had created his role on the Broadway stage but was not very well known as a film actor, later is nominated for a New York Film Critics Circle Award for Best Actor for his performance. 1942 Willys Americar Coupe. You could buy this for as little as $634 (up to $978) in one of three variations: Speedway, DeLuxe, and Plainsman. However, only 7000 were built, and for the next four years, Willys built the military Jeep.